Drizzle, shake, bake, and eat. To say we eat a lot of green beans around here is a pretty big understatement. I grow them in the garden because nothing makes you feel like you know what you’re doing in the garden than a dozen prolific green bean plants. When it’s not warm enough to garden, I buy 2-3 bags frozen each week… and when fresh ones are available, I like to go that route. Because fresh green beans roast beautifully – and easily – drizzled with orange and garlic. Make them in bulk and just reheat through the week. 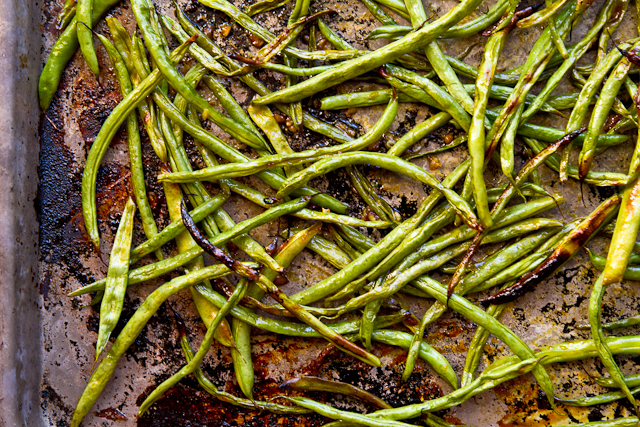 Assuming they last that long – straight-from-the-pan roasted green beans are pretty amazing. I think you’ve just inspired me to try growing green beans next summer 🙂 These look yummy, by the way! These look AMAZING. Adding green beans to my grocery list!